This is currently happening with bright green Sea lettuce Ulva and what is probably Devil’s tongue weed Grateloupia turuturu. The outlet grid of the Tunze nanostream is a good place for seaweeds to settle it seems; I have currently a little pluck of Flax brick weed Chaetomorpha linum growing and had a couple of other species there in the past too. 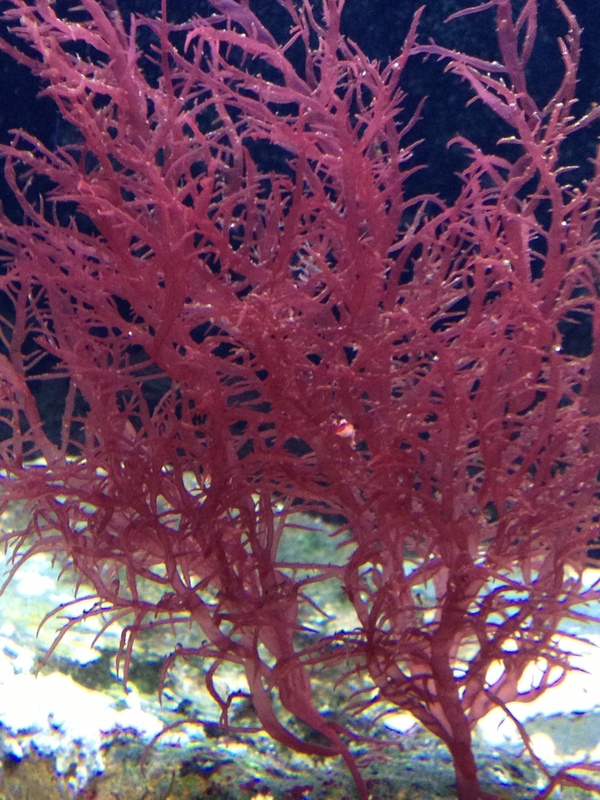 Spontaneous growth is of course the best way to get a seaweed aquarium going. Perhaps of interest to a handful of people… I have tried to list all seaweeds I managed to identify and remember, and whether they did well (YES) or not (NO) in my unchilled aquarium (lighting spectrum and intensity used varied somewhat over time). Why some species did not do well I have no idea (see previous post); in some cases, seaweeds were eaten. I have not tried larger species such as Kelp as my aquarium is not that big. 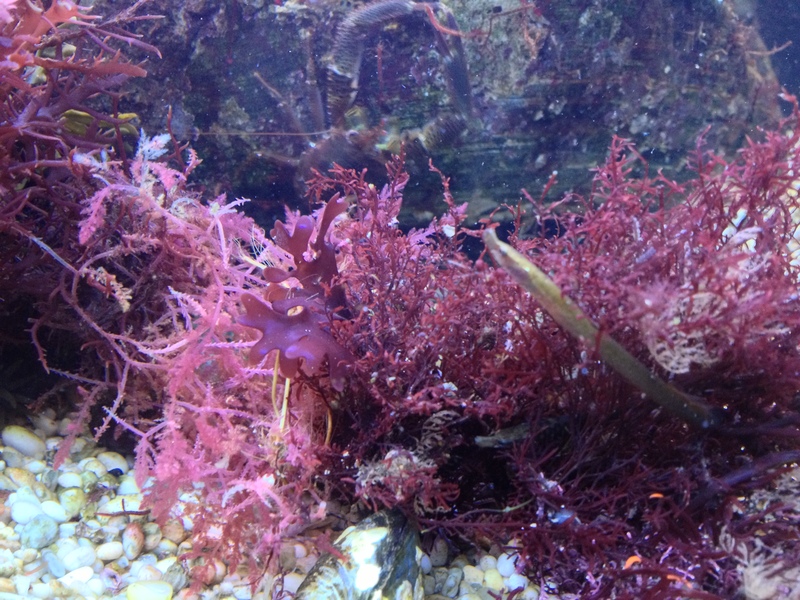 Above: Green (Velvet horn), Brown (Wireweed) and Red (Harpoon Weed) seaweeds in the aquarium. So 9 out of 21 species did OK in my aquarium which is actually not too bad (although I have forgotten a number of species that did not do well). Unsurprisingly, the invasive species were easiest to keep (5 YES in 16 natives, 4 YES in 5 non-natives; the difference is not statistically significant though). Finally, I just wanted to mention that I have been updating the ‘links’ page recently. 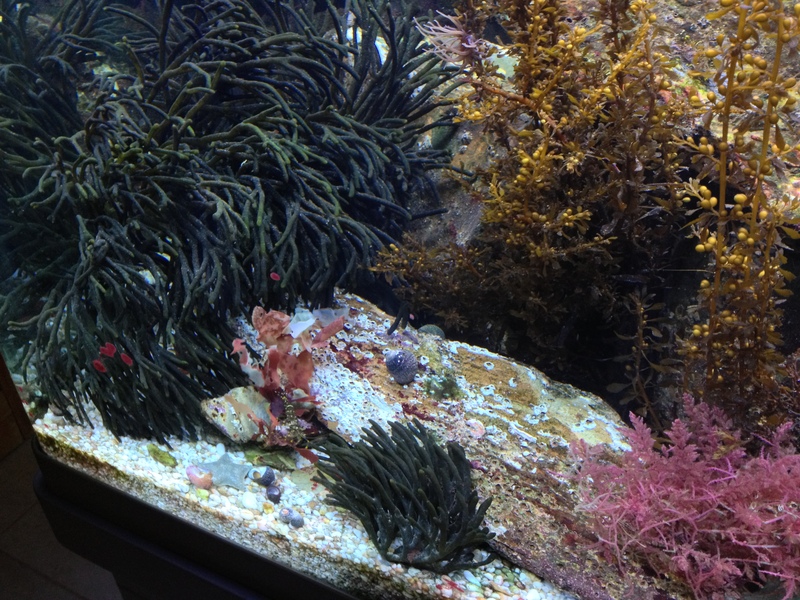 Regular commenter Marius has recently started a great blog about his new native marine aquarium with organisms collected at the west coast of Ireland: Irish Rockpool Aquarium Adventures, go check it out. A very nice rock pooling blog also is The Salty Scavenger which features loads of seaweed pictures. From now on, I will also register my rock pooling finds online here; with lots of volunteers doing that a great resource will be created that can be used for protecting marine habitats which of course is very important! I have also added a bunch of really useful links to facebook pages, for instance the ‘Coldwater Marine Aquarium Owners‘ group page. This entry was tagged Chaetomorpha linum, Chrysymenia wrightii, Devil's tongue weed, Dudresnay's whorled weed, Dudresnaya vertillicata, Flax brick weed, Grateloupia turuturu, planted aquarium, sea lettuce, seaweeds, Ulva. Bookmark the permalink. Hallo Miss Cellany, see how this world is strange, you are there and you want to have a Mediterranean seaweed aquarium, I am near the mediterranean coast and I look at the north sea species with envy !